﻿ Numancia 0-3 Real Madrid. First game of the year, first win! 04.01.2018 » Numancia 0-3 Real Madrid. First game of the year, first win! 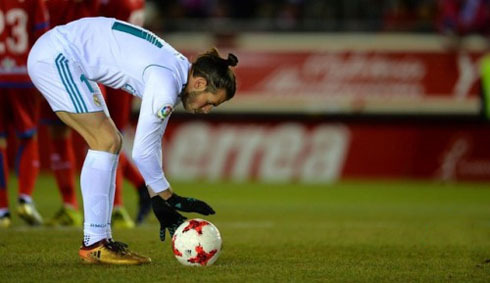 Real Madrid started off the new year with a comfortable 3-0 win over Numancia in a Copa del Rey fixture, with goals from Gareth Bale, Isco and Borja Mayoral. Cristiano Ronaldo was rested from today's game but he should be back against Celta, this Sunday night. The Copa Del Rey is going to serve as a testing pool for Zidane and the 'B' team players. Along with a recovering Gareth Bale, the youngsters were all on showcase today from Vallejo to Llorente, Mayoral, Ceballos, and Theo Hernandez as well. Yet, even with the changed lineup a lot of the issues that plague the starting team were prevalent as well: an over-reliance on crossing, a lack of ingenuity and poor finishing, all reared their heads during this match. Even Mayoral committed a "Benzema-esque" error when he blasted wide from the six-yard-box. 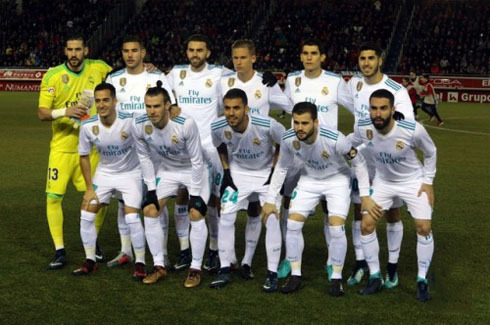 Real Madrid have become masters of the penalty it seems in this year's iteration of the King's Cup and just like the previous round against Fuenlabrada, Madrid would need the penalty spot to grab some goals. Lucas Vasquez, who was a torn in the home team's side all night, was fouled in the box during the first half, leaving Bale with an easy finish from the spot. The second half-bred more frustration as Numancia took the game to the defending La Liga winners. They were aggressive and their excellent home crowd pushed them on. But their aggression would show an ugly side as well, as the yellow cards racked up. Eventually, Pape Diamanka was sent off for a second bookable offense and they were down to 10. That didn't seem to stop them however and they continued pushing on. Even hitting the crossbar in fantastic fashion when Kiko Casilla was caught off his line. It's a bit alarming that Madrid couldn't soundly defeat a Segunda team down to 10 men, but they were at least able to put the tie away late. Another mazy dribble from Lucas led to another penalty late - this time it was converted by Isco, who came off the bench late. And Mayoral headed home a late third. 2018 will be an interesting year for Real Madrid and changes are certainly on the horizon. Let's see what Zidane has up his sleeve to rescue what's been a disappointing season thus far, at least by Madrid's lofty standards. Cristiano Ronaldo next game for Real Madrid is on January 7 of 2018 against Celta de Vigo. You can watch Juventus live stream, Celta de Vigo vs Real Madrid, Fulham vs Southampton, Manchester United vs Derby County, Norwich City vs Chelsea, and Liverpool vs Everton, all matches provided from our soccer live game pages.